Now this is definitely a novel way of approaching just what a roller would look like in an office environment, in the form of the $9.49 Roller Notes. It definitely allows you to capture all of those fancy ideas as well as comments from your snappy colleagues in a “coat” of bright pink “paint”. Yeah, the Roller Notes will get the job done, and the only amount of time that you need to wait for something to dry would be seconds, with ink instead of paint here drying up in a jiffy. Each time you roll the Roller Notes, it will dispense some self-stick note paper – just trim it to the size that you desire and you’re good to go. Seems that pink is all set to shame the all too common yellow! 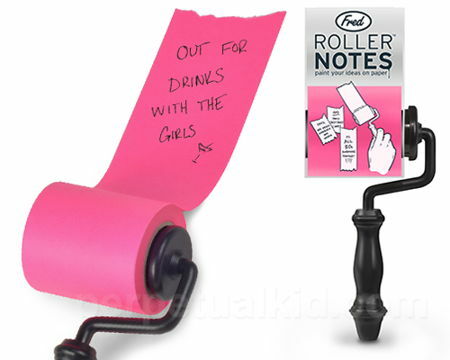 The Roller Notes would measure 5″ x 1.75″.